Watch Dogs is the last mature title Ubisoft will publish on Wii U. "It's very simple," says Ubisoft boss Yves Guillemot. "What we see is that Nintendo customers don't buy Assassin's Creed." Or any other mature title, so Ubisoft is switching its Wii U sales strategy. 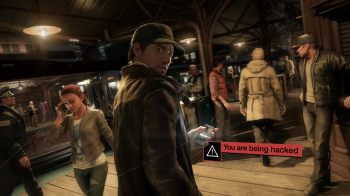 Watch Dogs will be the last mature title Ubisoft publishes on the Wii U. After that it will switch to titles more appropriate to the console's target demographic. ""What we see is that they are very interested in Just Dance," says Guillemot, "Very interested by other kinds of games." In fiscal year 2013/14, Wii U sales made up only 3% of Ubisoft's total sales, a drop of 1% from the previous year. Not that long ago, Guillemot was adamant that Ubisoft wouldn't create any more Wii U games until Nintendo sold more consoles. Ubisoft sees no point in creating games that won't sell, and it isn't the only one. In January Warner Bros Interactive Entertainment cancelled Wii U DLC for Batman: Arkham Origins, citing insufficient demand. Sega's Alien: Isolation isn't due on the Wii U either. EA at one point was supposed to have said that 'Nintendo was dead to us' after the Wii U launch, and while that statement was later denied by Peter Moore, one of the reasons given for the alleged statement at the time was that the platform wasn't suited for mature titles. Last year EA said it was reluctant to throw good money at a console that wasn't selling. In January this year Nintendo revealed it expected significantly reduced sales of its Wii U.